The Honorable Isiah Leggett, Montgomery County Executive; The Honorable Nancy Floreen, County Councilmember, At Large; The Honorable Tom Hucker, County Councilmember, District 5; John R. Maneval, Deputy Director, MD Community Development, Administration Department of Housing and Community Development; Deacon Robert Barnard, Lay Pastor, Mount Jezreel Baptist Church Deacons Ministry; Deacon Gregory Brown, Lay Pastor, Mount Jezreel Baptist Church Trustee Ministry; The Rev. Eldridge Spearman, Senior Pastor, Mount Jezreel Baptist Church and Chairman of the Board Mount Jezreel Community Development Corporation; Sarah Constant, Managing Director, Mission First Housing Group; Dan Henson, The Henson Development Company; Paul Connolly, R4 Capital; as well as project partners and community members. 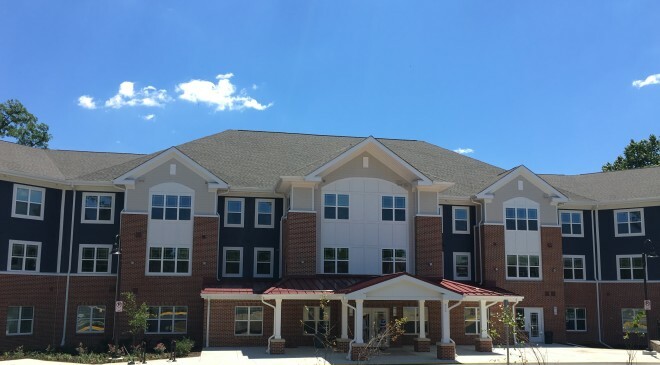 The Sanctuary is developed under a partnership between Mission First, Mount Jezreel CDC, and The Henson Development Company, is a new construction 75-unit apartment building for seniors located in Silver Spring, MD. The development includes 12 units set aside for low income elderly veterans, as well as targets seniors at a variety of income levels. The site is located on the campus of Mount Jezreel Baptist Church. The development includes green and sustainable design and construction components, generously sized apartment homes, and desirable amenities, including a library and sitting room, community space and party kitchen, wellness suite, fitness center, inviting porch and patio, as well as a “Children’s Room” and tot lot where the residents can actively play with their visiting grand- and great-grandchildren. The development was financed using Maryland CDA Tax Exempt Financing under the HUD Risk Share program; CDA Rental Housing Works; Montgomery County HOME funding; and low income housing tax credit equity through R4 Capital. Mission First Housing Group develops and manages affordable, safe and sustainable homes for people in need, with a non-profit, mission-driven focus on the most vulnerable. We ensure our residents have access to resources to help them live independently. We deliver housing that provides long-term benefits to residents and neighborhoods, alike. Mission First is a full-service real estate organization developing high-quality, green community assets across the Mid-Atlantic region. Mission First currently provides affordable housing and services to over 4,500 people in nearly 3,500 apartments, serving populations in need, such as veterans, survivors of domestic violence, seniors and the disabled. More information at www.missionfirsthousing.org.